Take a hassle-free trip to Pearl Harbor and see the highlights of Oahu’s North Shore with this combo tour. Gain skip-the-line admission to the USS ‘Arizona’ Memorial and see a film about the World War II attack at the Pearl Harbor Visitor Center. Then visit legendary surfing beaches on a drive around Waimea Bay and more. Start your small-group tour with pickup at the Kahala Resort, Waikiki hotels, the Honolulu cruise port, or the airport. First, you’re chauffeured by luxury van to Pearl Harbor where you are offered juice or chilled bottled water before you’re accompanied to the entrance of the Pearl Harbor Visitor Center. Here, you are met by a tour representative who provides you with your reserved ticket to the USS Arizona Memorial. 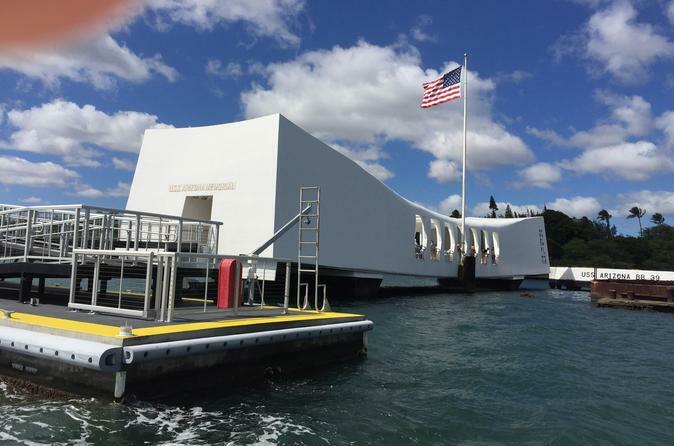 Once you're transferred by boat to Pearl Harbor’s most visited monument, there's no need to wait in line. Simply use your priority admission to explore this top Hawaii destination at your own pace. After fast-track entry and an audio tour, eat a hot dog lunch with soup, served in front of the USS Bowfin submarine. Your driver will pick you up for a guided tour around the North Shore. See spectacular views of the world-renowned shoreline, including Pali Lookout, Chinaman's Hat, Mormon Temple, Sunset Beach, Waimea Bay and Turtle Bay. You’ll visit Haleiwa and the Dole Plantation before you’re transported back to your starting point.